Pretzels………..something near and dear to my heart that I REALLY missed! I have tried several different kinds of gluten-free pretzels and will post my ratings on the others later, but wanted to start with what I feel to be the best gluten-free pretzel I have found. These pretzels are so good, that my family asked that I continue to buy these pretzels for them instead of the others I used to buy. I am giving this product my highest rating ♥♥♥♥ with a scoring of 18 out of 20 possible points. Appearance/size: These pretzels come in two shapes, sticks and mini-pretzel. They are the same size as their gluten filled counterparts. I have been able to serve these at many a party with NO one noticing any difference. Flavor: At first taste, its hard to pick out the subtle difference in this pretzel. Trying to put into words is even more difficult. It is as if it is a “cleaner/clear” version of a pretzel?! I hope that makes sense. LOL! Several different flavors followed by that salty punch. They do not seem to have an aftertaste or a chemical taste like some gluten-free snacks do. Texture: This pretzel is EXACTLY what you expect a pretzel to be. 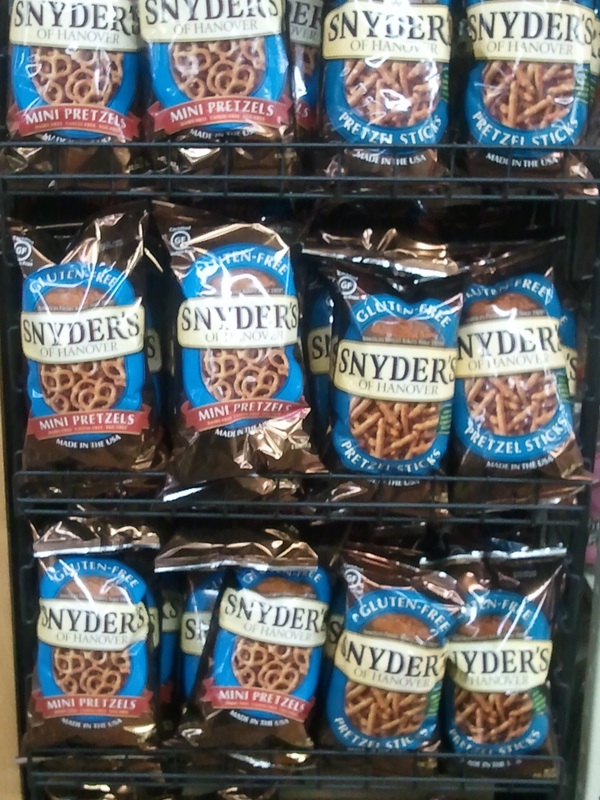 Crispy, crunchy – exactly like their other Snyder’s brand that I had enjoyed for so many years prior. It stands up to any dip I’ve used it in and are great snacking by themselves. I have even chocolate dipped them and YUMMMOoo! Price: The price is right!! At my local Woodman’s store ( 100% Employee Owned Independent Grocer) I paid $3.19 for this 8 oz bag. While more expensive than the cheap wheat filled brands, it is MUCH less than the other popular brands of gluten-free pretzels like Glutino….AND 10 times better in flavor and texture. Trust me on this one – IF you love pretzels – check these out. You WILL NOT be disappointed! Previous Post WHERE can I find Gluten free products? Actually we are not part of “Albertson’s.” In fact we are a 100% Employee Owned Independent Grocer. Thanks for shopping with us! Thank you for the correction! I have made the adjustment in the blog. I’ve been shopping at your Pleasant Prairie location for years. You have the best, largest gluten-free section at reasonable prices! Soon I will be posting a review of shopping for gluten-free and will be sure to include you again!